This blog is of the life of Carol and Richard after retiring from Silicon Valley in the USA. We moved to India in 2007 to stay at the foot of the holy mountain, Arunachala. Then after eight amazing years, we moved to Mexico, where we now reside. We love our retired life, and I share what I love. For a bit more about us, go to about us. Our first impressions of Ajijic The center of the area in which we now live. Who is La Catrina? The skeleton figure La Catrina is a common Mexican image. What is her story? Here is the Ramana shrine in our new house. Arunachala is loved by many people around the world. 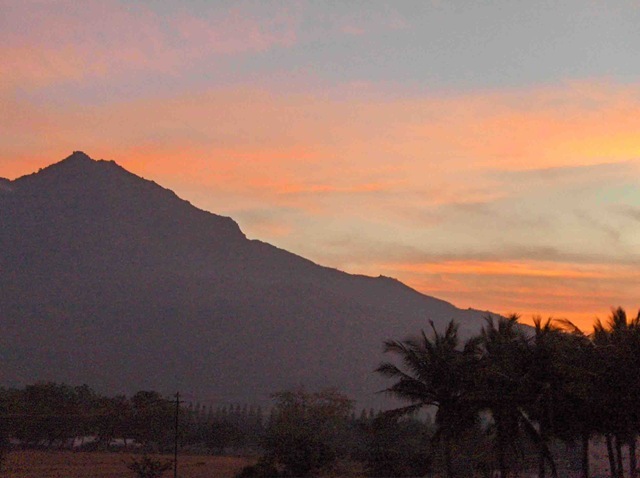 This blog shows more of Arunachala and India than many people ever see. This blog may remind you of what you love, and help you discover more about India. Tamil culture and Arunachala are featured. Resources for Western Visitors to Tiruvannamalai Find what you need for a successful trip. Top Things to See in Tiruvannamalai Recommendations of special places to see. Ramana Ashram Posts showing Ramana Ashram and ashram events. Bhagavan Sri Ramana Maharshi Timeline and Places Sri Ramana’s timeline and links to posts on associated locations. Arunachala Guide Guide to Arunachala, Pradakshina (Girivalam) route, the Inner Path and many of its caves. The most comprehensive guide to Arunachala. Guide to Arunachala Pradakshina Route for Arunachala Pradakshina, and temples and shrines. The eight sacred Lingams and how to approach them. Giripradakshina scenes. Tamil Rites of Passage Tamils are an ancient people. See how they celebrate the passages of life. Tamil Villages – The Ancient Heart of Tamil Nadu This four part series shows the ancient Tamil culture alive still today. Festivals and Celebrations in Tiruvannamalai Religious celebrations are a big part of Tamil life. See these festivals. Life in South India What is life like in Tiruvannamalai for Westerners? Touring and Travel in India Travels within India. Touring and Travel outside India Travels in Nepal, Bhutan, Vietnam, Cambodia, Thailand, Peru, Guatemala, Nicaragua, and C.
Spiritual Teachers and Teachings A bit on spiritual teachers, with an eye towards my teacher, Nome, and those who visit Tiruvannamalai. From the main page, use the Recent Posts and Top Posts to get started viewing the blog. Other featured posts and series are listed above. On any page, clicking anywhere in Arunachala picture / blog name at the top of the page returns you to this page. This is important, since the individual pages do not have the ‘Navigation bar’ shown to the right of this page. If you wish to receive automatic updates as new articles are added, use the Subscribe by email function, on the menu to the right. Comments and questions are welcome as long as they are not abusive. As a notice to all who comment on this blog: negative behavior is not acceptable. Thank you for your wonderful web site . I read it a lot for my first trip to Arunanchala. Just a question : I will come this year in september , at this period : is there a lot of mosquito ? in order to prepare my things. My doctor say that it may have malaria problem, so medicine the gave me some medicine… but never seen anything like this at Tiravannamalai , how is it ? It is there, ask at a pharmacy. Hi., Is there Any possibility to buy Original Rudraksha Inside the Temple? I do not know, sorry. I think they are available outside from vendors. Thank you so much for the wonderful help. Sri Ramana Maharshi will be happy for your dedication to Arunachala. I have one question – Are you able to tolerate the Sun heat in Arunachala. I heard that it will be very hot during summer. Is it true? When it is hot, we just ouwld go out early in the mioening. Still OK till about 10 AM. I did an outer path Giripradakshina in December along with my parents and encountered the trouble of not finding Toilets / Urinals during our walk. We saw around 2-3 toilet complexes (if I can use that word) at vairous locations but they were all LOCKED!!! I plan to return in Feb end and would like to know who holds the keys to these locks? Sorry for the rather inappropriate question. I agree. Someone should talk to the Tiruvannamalai Collector about this. I can’t, leaving India soon. Nice post. Such a wonderful information about Jain Tirth and Jain Religion. Are you in Tiru at the moment,, if so i’ll be happy to catch with you,, for tchai or walk,, i certainly will do a lot of your suggestions for walks , temple visit and of course get through your list of indian eateries,, that will be my 5th visit and can’t wait to return home!! Do no tknow where to stay in Trichy. We are back home IN tIRU FOR A FEW DAYS, WAITING FOR A HOSPITAL APPOINTMENT IN pONDICHERRY. Maybe we can meet for chai at the Ramanasaramam chia at 4pm in the dining all. Call or SMS me at 9486341734 to confirm. Try maybe the HIllview for accomidations, or ask rickshaw drives in from of Sheshedri ashram for help with a place to stay. I am a Bhagavan devotee living in New Delhi. I have sent you email earlier on whether you have a copy of Saddarsanam with Master Nome’s commentary. I am coming to Tiru in December and would like to know if you have a copy which I can buy directly from you or if you could send me a copy by post? I would also like to know your Tiru address so that I can attend satsang at your house. I had the book in storage, and today went in and got a copy of Saddarsanam with Master Nome’s commentary. I can post to you. Please send me your mailing information. I will be ha[pp[y to meet with you when you come in December. I have sent you my mailing information on your e-mail ID. I will ship it out next week. What did Raman of SAT say about payment for the book? He said that SAT does not supply in India, but that you may be having copies of it. He said he could send me a pdf of the book for 9.99 dollars. I said I would try to get a hard copy. Ok, I will send you the book. I AM JUST a private party, work out the cost and payment with Raman at SAT. Thank you, Sir. I have received the book. May Bhagavan bless you. I believe it is Bhagavan’s Grace that I have been exposed to Master Nome’s teachings. I have written to Raman regarding the payment. Mr Raman has acknowledged receipt of payment for the book. I have also sent you a money order for the shipping charges. Thanks. Hello Richard…I am in shock that you are not the Richard with whom I lived and studied at AHAM ashram from 2004-2005 in both Asheboro and Tiru under the guidance of A. Ramana. I just recently reposted your internment photo essay on my Facebook page just assuming that you were him, as he looks like you, is named Richard and also kept an Arunachala blog…and he, too, was at A. Ramana’s internment ritual as he lived AHAM’s Tiru ashram in the winters. Now I am totally intrigued by the fact that you are not him but that you were actually there. How blessed. Finding your blog post meant so much to me and gave me the impetus to contact friends from that period of my life at AHAM in Tiru. The last time I saw A. Ramana was sitting at his picnic table at the ashram in Asheboro in April 2005. Thank you so much for your photo essay and tribute to a great teacher. Can we expect to see some election scene reporting? Thanks for your good work !!! we will be out of the country at the time of the elections. Sorry. This is Ram and I am in charge of strategy at Tamilnadu.com. Tamilnadu.com is the brainchild of Dr. V. A. Shiva Ayyadurai, the inventor of the world’s first email system. You can read more about him at inventorofemail.com. We wish to relaunch Tamilnadu.com as a stylish and well designed online newpaper which would be a platform for Tamils of the world to make themselves heard. I read some of the articles on your blog and would like to repost a few of them in the Culture section on the redesigned Tamilnadu.com which will be launching on March 15, 2014, when Dr VA Shiva is in India. We will be crediting you with the article with a small biography about yourself and a photo and a link to your email / website. I would really appreciate it if you could grant me permission to reuse a few of your articles and would also like you to send me a bio and a photo of yourself that we could publish on your profile page on Tamilnadu.com. Thanks in advance. Please use what you want. I am pleased to share these with you and offer them to your readers. I will send you profile information soon. I am traveling now and do nhot have all at my hands. so great is your article. i am delighted by reading and absorbing each and every word, thank you and Arunachala blesses you. I have avidly followed your blog over the last couple of years, when I discovered it by accident. I am fascinated by the fact that you find India so fascinating. I am Indian by ethnicity. I was born and raised in Tamil Nadu, and lived there until I was 21 years old. Then I moved to the USA to study, and later to Canada. I am now settled in Canada along with my family. I am no longer an Indian citizen, and have maintained only slim contacts with my relatives and friends in India. While I was growing up, I could not wait to get out of India. Sure, I liked and even loved a lot of things about the country (and still do), but the positive feelings were overwhelmed by feelings of revulsion over almost everything I saw around me. I loved the festivals, the kolams, the temples, the rituals and celebrations, the food, the history, literature and mythology, to name a few things. I hated the dirt, squalor, poverty, dishonesty, corruption, overpopulation, petty-mindedness, caste and religion-based quarrels, bad roads, mosquitoes, frequent electricity failures, rampant medieval attitudes towards women, litter everywhere, no civic hygiene, treatment of animals worse than garbage….. the list goes on. I still retain those feelings. I never visit India unless it is absolutely necessary for me to do so. I visited Thiruvannamalai a couple years ago and did the girivalam. The squalor around the city was as bad as anywhere in the country, notwithstanding the fact that pilgrims are expected to do the girivalam while barefoot. Since I don’t have a death wish, I chose to walk with my shoes on, but I simply can’t understand what goes through the minds of ‘pilgrims’ who litter everywhere and make the path dirty when they know very well that they and other pilgrims have to use that same path with bare feet. Even though I share the same blood, skin and genes as the rest of the pilgrims (being Indian by birth), I cannot understand most other Indians. My question to you is: why did you give up a comfortable life in a civilized environment like the USA to roast in a hot hell like India? How do you manage to survive the lack of electricity, water and most everything else that makes life livable? And WHY do you want to live a life like that? Why not go back to the USA and live happily there? We like it here. We have learned how to live here comfortably. We can afford to live on our ss checks, which we could not do in the us. We find much of interest here, and there are always new things of interest. In India there are many temples. In the us, shopping malls. The life of the people is richer, even without all the things of the west. The faces of the children are brighter. The families are stronger. Sure there are hardships, poverty, etc. Just like in the us. There is more richness of life, though. My grandson said, amazed, that people talk to each other here. Interesting post. I don’t live in India, but in another nearly 3d Word country and share with spvy feelings about the environment here. As I was reading your post, I was hoping that you were going to say that you cannot wait to get to t’malai. Instead I found you asking people in pursuit of the self to go back to a materially comfortable life. I am just like you. Grew up in TN. Now I live in the US. Absolutely love it here. But I cannot wait to go to T’malai and settle there. I m just making money here to my settlement there. All that is said about India is true. But in search for the truth these things do not matter. I wrote that I was moving to Mexico. This was a personal statement, not a recommendation for others. I am sorry that you construed it otherwise. Certainly spiritual pursuit does not depend on any location, thought to live in a place where people are less materialistic is a help. I wish you well in your efforts. Loved your blog… Thank you for your service for ramana maharishi lovers I love bhagawanramana , but find it difficult to undeerstand and practice self inquiry.. vasanas and mental tendencies are a big obstacle…pls guide. replying by email. Best to have this discussion just between the two of us, and not in the comments of the blog. An Opportunity to soak yourself in Ramananjali Music, Meditate on Arunachala and Express the joyous creativity. I am surprised that you have not met Sri Nochur Venkataraman. I was fortunate to attend the Bhagavatha Sapthaham held at Haridwar from Oct. 18 to 25, 2013. He is a scholar, no doubt, but more than that, he is a realised soul who has a passion to talk about advaita vedanta. Sri Ganesan, grand nephew of Ramana Maharishi, rates him almost as a reincarnation of Sri Ramana himself. He warns people not to miss the opportunity to benefit from interacting with Sri Nochur Venkataraman. Needless to say, he is easily accessible and unassuming. These days he lives in TVMalai. A series of lectures by him on Akshara Manamalai is scheduled from Nov. 8 thru 15th in TVMalai, I believe in Ramanashramam itself. Please make use of the occasion. This series is likely to be in Tamil. You can download discourses by him in Tamil, Malayalam and English from several sites on the internet, Geetham.net being one. Sri Nochur Venkataraman is a brahmin and married householder. He got attracted to Bhagavan Sri Ramana teachings from early childhood and had been into very orthodox and sadhana dedicated family. Having incurred all satvic qualities he considers devotion and knowledge both to be of same expression . He gives very deep contemplative lecture on Bhagavan’s Naan Yaar, Ulladhu Naarpadhu and other tamil works. He also gives beautiful lectures on Bhagavatam, Yoga Vashistam and other scriptures in English, Tamil and Malayalam. He is a sort of mystic but never boasts about himself. One can call him a Maha Pandit and a Pravanacharya meaning one who is immensely qualified for lectures which are called Pravachanams in Sanskrit. He visits Sri Ramanasramam occasionally and highs english lecture CDs can be obtained from Sri Ramasramam on order basis. As you were asking somebody about him I thought to reply you. How do I meet Mr. Nochur Venkatraman in Tiruvannamalai? I checked the website where his schedule is posted and there is nothing planned during my visit to TMalai. I am assuming that it means he would be at home. I could not find his English lectures anywhere. The sumukum website errored out when I tried it. I am getting delivery failure from richard@infiniteppie.net email id. I recently inquired about your Old age home in Tiruvannamalai (Address: Samutiram Village, Near Ramanashramam). And i came to know that it has been closed. Is it still functioning ? First, my email is richard@infinitepie.net. The address yo used had two “p” in it. I am wondering about how to meet Mr. Nochur Venkatraman in Thiruvannamalai and your experiences meeting him. Who is he? I am not sure if I know him? You’ve posted that one can turn a tourist visa into a residence permit. I know this used to be possible, but is it still possible? And if so, is it possible in Tiru or everywhere there’s an FRO in India? “They” change the rules all the time – that’s why I’m asking. And if anyone else has the latest info on this subject, I’ll be most grateful to hear. You apply at the Foreign Registration Office at the Tiruvannamalai District Police office within 10 days of arrival to India. You stay working with the same offic e during your stay in India. Different places have different approaches, IN Tiru it is OK. Thank you, Richard, for your prompt reply. Much appreciated. Having lived in Tiru for 15 years (’80 to ’95), I really appreciate the service you are performing with this blog. Many people, especially newcomers, will be spared endless trouble as well as being educated about the area, the customs, and the local ‘how-to’s’..
Hi Richard nice work, we would like to know how to go about arranging the feeding on Pradakshina road for Sadhus. Who do we contact to get that info? email me at richard@infiniteppie.net. I will see what I can do. Do you know any cave in Arunachala where one can meditate for a long time? And what about food and water? as fer nityananda is concerned,..without getting into any contraversies…..i feel his knowledge books are really good…just take whats good and ignore bad…at the end of day…u have to live your own life…. hiii…i loved ur blog. i dug every word u have written …i had my own share of mystical experiences which i have chronicled in my blog. i am curious and would love to converse with you and know your spiritual odyssey…iam planning to come to Arunachala this weekend to experineces rich spiritual vibrations of holy Hill. My name is Seth, we met at SAT a few times. Great blog!!!! I am wondering if there is any update on inner Pradakshina, or if it is even possible? I am thinking of coming. Inner Path still closed, maybe this will change wince there are new officials now involved. We will see. Evfen if closed you can still go to the top of Arunachala. Hi Seth .Lets go together ,in early Nov.
Hi Richard.I think that I am returning to The Great Arunachala ,this November, but only if my guru, Sri Sarada says that I should, and as usual She’s not responding to my letters,so could I trouble your good self to ask Her please ? She lives at a house about 1km south of Ramanashram called Arunachala Hrudayam at the end of the newish road. I am Matt Toerien who lives at 70 Clare Crescent,Leatherhead,Surrey KT22 7QZ ,U.K .email add:matttoerien@hotmail.com . You will be very fortunate if you get to meet Her. I would like to meet you as well. My name is Sathya, planning to Visit Thiruvannmalai first time and me and my wife both wanted to do Giri pradakshina , I have Two kids girl (8) and Son (4). It would be little tough for them the do pradakshina , Is there any Rickshaws ( man pulling) available in thiruvannamalai ? I’m bit nerves , Please suggest ? There are rickshaws if you get to where it is too hard for your kids. Call Rajan 9442415221 if you do no see one. Do not be nervous. around Radha Ma’s passing in 2011.
thoughts you might have on the subject. I cannot say anything to give you any more clarity. All I know is rumor and speculation, and none of this is helpful. That is great works done for the elderly sadhus! I have been following your blog for several years. It’s my birthday, a good day for me to donate via paypal. Thank you for the delightful story of Narayana Seva. Do you know of any, or could you possibly ask around, if there are any physiotherapists in the area? Local or Western? I want to spend time in Tiru but I have to continue rehab for a broken leg and could use the guidance. Also osteopath? Massage? There are massage therapists here, and osteopaths. NOt sure of Physiotherapists. From the website of Ramanashramam, I was able to get the translations of Dakshinamurti Stotra and Guru Stuti. Please help me with the tamil translation by Ramana Maharishi of 2. Shankaracharya’s Hymn to Dakshinamurti. NO plans. MY wife attended Kumbh Mela, I think in 2010 or 2011. Are you going? Thank you for the kind words. It is all service to Arunachala. It is grace that lets us serve. Hi Richard, we met briefly last week at Ramanashram where I was with Saran. For anyone going to Tiru I cannot recommend Saran highly enough, he was brilliant and his love for Arunachala shone brightly each day we were out together. I met him through your blog and so a big thank you to you too. Just a note for anyone wanting to climb the mountain (and it was the highlight of my stay) good footwear is very important. Saran has a good walking pole which he lends out and also a backpack as he will carry your things but you do need trainers to be comfortable for some parts a quite stony. I am glad that you have a good visit and that Saran was such a good guide. I do think he is the best guide that you can find, and his love for Arunachala is one big reason. You certainly are right about shoe, good shoes are important if you are going to climb the mountain. Wonderful. You are getting off to a good start. Also his name is Saran. I am very sorry. We are in Kathmandu right now, will not be back in Tiruvannamalai until mid-Oct. Thanks Richard, for your efforts. I so enjoy your blog and my memories of Tiru. Thanks for sharing your great photos. Very excited to be returning for Deepam and staying into Jan this year. Wondering if you may have a phone number or email for Mr. Sham the proprietor of Mountain Breeze guest house in Tiru. Will be returning there this fall and wish to rent from him again. Thanks for your help and consideration. i am so facinated and read the writings of Richard. he is doing fantastic service to bring alive all information of arunachala. Have you been Tirukovilur next to Tiruvannamalai. In Tirukovilur, there is a Vishnu temple at the center of the town. It is Ulagalandha Perumal / Tiruvikramaswamy temple. The veerataneshwarar temple is a Shiva temple which is older than the Vishnu temple is in Tirukovilur. It is located in the same Arakandanallur were the cave temple is located. If visit or already visited please post the pictures of veerataneshwarar Shiva temple. Here is a link to the posting about the Siva temple you asked about> https://richardarunachala.wordpress.com/2009/06/17/tirukkoyilur-where-ramana-stopped-on-the-way-to-arunachala-part-one-arayaninallur/ It was posted three years ago. hey richard, hope this finds you enjoying the moment.. I am currently in auroville and hoping to make the journey to the mountain in the next few weeks, and i was hoping you might be able to help me track down 2 beautiful canadians i met in mcloud gang a few years ago… The info i have is pretty sparse as unfortunately all info , addresses, etc went the way of the west wind.. They live or are from somewhere across from vancouver island, maybe in there late 50s early sixties and have a house on the other side of the mountain. I know the other side is probably not much use, but thats what i remember them saying ” go to the other side and ask for us, but as i dont remember their names, that is probably going to be a problem.. Anyway, if any of this rings any bells, fantastic, if not, then thats the way its meant to be… blue skies, mark. Just wanted to say how much I am enjoying your website. We were met you at the Ashreya Hotel where we were staying in November. We were only in Tiruvanamalai for 2 days although I had been there once before a couple of years ago. After reading the articles I now wish that we had stayed longer as I would liked to have explored the mountain a bit more. India is such an amazing place and in many ways I envy you for making a life there. I would like to share my views about the greatness of Sri Ramana Maharshi’s teaching which is the path of self enquiry. Previously, the question who am I ? was very confusing later when this question became very serious in my mind, I found in one of Sri Ramana’s book that the enquiry – who am I would make sense only if the mind is turned inwards. He has recommended eating sattvic food, being in the company of seers (sat sang), or doing japa, meditating / uttering the divine names/attributes of God with such an intense feeling that the meditator, the object of meditation become one and finally what remains ultimately is the experience of meditation. He has also strictly advised to the seekers not to speak ill about others and interfere in other’s matter as this would pollute the mind and make it flow outwards. He further explains the seekers about self enquiry with the example of an Hand kerchief..the hand kerchief is composed of minute threads thus the collection of these threads is hand kerchief. Similarly, mind is nothing but collection of feeling, latent tendencies which we have accumulated over a vast expanse of time.. when the seeker realises that he is not the personality who is getting affected by the feeling be it positive or negative for example, the feeling may be happiness, sorrow, greed, jealous lust, pride, virtue, helping tendency, or any other good / bad attribute for that matter then he becomes free from the influence of these tendencies. The seeker can actually “see” this drama going only if his mind is turned inwards. Because a mind turned inwards has tremendous strength and like a concave mirror burning a piece of paper by concentrating sun’s beam, a concentrated, inwardly turned mind can burn out the latent tendencies of the mind. Thus the seeker could find that because of certain happening which he/she has experienced in the past, he/she has imbibed a certain type of personality or a feeling (positive / negative) which actually ‘suffers’ or ‘enjoys’ but the seeker remains a mere observer unmoved by the experience (pain/joy). He just remains a witness. At this stage, the mind reaches a state where it doesn’t get affected either by pleasure or pain. The mind reaches eqanimity which the Hindu scripture – Bhagwad Gita refers as “Sthitha Pragya” (meaning sthitha – equilibrium, pragya – consciousness). Thus the seeker’s mind attains a state of equlibrium and for such a seeker there is nothing like friend or foe. He treats every one as equal because he clearly sees that the there is no “person (good or bad)” in others but only personalities (good and bad) exist. As the mind becomes quiter and quiter because of this uninterrupted witnessing consciousness (which the buddhist say Zen meditation) the seeker slowly becomes aware that there is nothing called mind. Because the identification with ‘inner personalities(good / bad)’ has almost faded. So, he gives up judging others. For such a seeker, the question WHO AM I strikes like a thunder bolt on the pseudo existance of the mind. with this Self enquiry, the seeker becomes identified with the changeless, pure self awareness which the Hindu scriptures mention as “Atman”. Thus, the “person” gets totally “relieved ” “personalities” what remains is existence which can not be described. But even to a worldy person, if his / her energies are surrendered to a Guru (like Bhagavan Sri Ramana). If the “mind” is able to find rest at the lotus feet of Guru, then he / she need not worry about “getting” liberation because Sri Ramana insists that by surrender, the seeker surrenders everything to Guru and even the question of getting freedom will NOT arise in seeker’s heart because the ‘questioner’ should cease existence if the seeker has truely surrendered. All of us are really blessed because it is our good fortune that we have heard about Sri Ramana. I would call this a good fortune because out of millions of people in this world only few have came to know about him and only very few people were able to comprehend his unique approach of self enquiry. Can you recommend a good Vedic astrologer in Thiruvanamalai? Many thanks for your blog. Do not know, maybe another reader can recommend? We enjoyed chatting to you at the Hotel Ashreya at Tiruvannamalai in November 2011. Hope you are both well. Thank You very much for such lovely pictures of Arunachala ! Can you tell us something about Hillviewresidency, is it any good because the prices are really good for us. We cannot find any info about this hotel other than their website so we thought we are going to ask Richard because he knows. We are planning a trip to tir. in Februari/ March. Thank you so much and Namaste. Hillview REsidency is pretty close to Ramanasramam and to places to eat and internet cafes. Rooms usually good AC available (you will want in Feb/March. It is a place that I suggest. Prices good, too. Some people have had problems with the people who run it, others not. Om Namo Bhagavate Sri Ramanaya! I am a constant reader of this blog and like very much your posts and also the photos you take. I am just preparing a simple video with Arunachala as subject, and I’d like to have your permission to use some of your shots in this video. My intention is just to pay a humble homage to the mountain and to my guru, Sri Ramana. If you give your permission, when ready the video, i will upload it in youtube with the proper credits. If you prefer, email me at ana,bhakta@gmail.com. Certainly you can use my photos. Please creadit ‘Richard Clarke at richardarunachala.wordpress.com. Richard, please contact me at zfireiam(at)yahoo.com You may remember me from NoMe? Zephyr. I need some help with a situation in Tiru and you are the perfect Being to help in accomplishing this simple task. Thanks Brother, look forward to hearing from you! or a village, or a traditional event and etc in Tiruvannamalai. Good work. Keep it work. Looked at your blog, can not read Tamil, so cannot read blog. Tiruvannamalai is not what inspired me, it was Arunachala. No I have not, sounds like it would be interesting. Thanks. Then Gautama Maharshi, an expert in Pranayama, went into deep meditation on Varuna Deva for 6 months. Then Varuna Deva appeared before him and offered him a boon. (It is interesting for us to see that Gautama did not do a Yajna, he did a Tapas, and that it was directed towards Varuna Deva and not towards Indra. Gautama asked Varuna to make it rain. Varuna said, “How can I disobey the Gods and make it rain? Please ask for something that I can do”. Then, Gauthama, who wanted to help others, said, “Please give me a water source, that never dries and gives us rewards everyday”. Then Varuna made Gauthama dig a shallow pit (as deep as a hand’s breadth), and filled it with water, that would never be exhausted, that would be called Gauthama tirtha. And the special reward of that Tirtha was that any tapas, or charity, yajnam, or shraddham performed in that place – would also have everlasting effects. , because of the inexhaustible water supply, there was never a drought again. The 7 wells in annamalai is the replica, Gautama Maharishi wife is daughter of Brahma and Gautama Maharishi gave place for UMA to unite with SIva to become arthanari. It is a fact not many knows that seshadiri when he went to see the place where UMA met Siva was struck by lightening and the person who poured water on him could see fumes. the rishi died after four days and buried at Ramana ashram.. It was Ramana Maharishi who sent Seshadiri with an intusion and then quoted Sehsdiri got the punya instead of me. Hope you and carol are doing well. I regulary follow your blog. Since last year I have been coming to TVM every 3-4 months. I want to meet you when I come over there next time. Could you let me know how can contact you over there? And Further I am now desperate to buy a land. When I was there(TVM) few months ago I met a Swami who predicted three deaths , that will happen as the result of Raja minister deals . Today just now reading the news e version of Times I was shoked to see the second death of 30 year nephew of Raja. I was also told by this Swami that Japan is the north east position in the globe and called esan portion of the world the wet area of death and birth as per Siva’s law and he told me to help him do a pooja for Biravar for 48 days at the agni of SIva which is TVM and take it to Japan and install it there. Lookign at the hindsight well the problem of Japan is they have kept agni or the reactors in esan of the earth and Siva the destroyer has started his rudra destruction dance. It is good that you want to look at the4 land, not buy from Internet. I am not a land or real estate expert, and there is only a little help that I can give. Are you Indian? Or NRI? The rules are very different if not. Hello, Richard, and thank you for this informative website. Question what do all of you do about malaria? I too am thinking of coming to Tıru for resident sadhana, and I wonder what precautions are necessary. We learned from an Indian nurse in the USA that the same medicine used to prevent the disease is the same as to cure an infection. So we do not take the preventative, but have the meds so in case we have a problem we can start taking them. Any idea if Swami Annamalai is still alive? Does David Godman live in Tiruvannamalai? Thanks again for all your help! Swami Annamalai was killed in when a motor bike hit him while he was dancing around Arunachala, maybe three years ago. David Godman still lives in Tiru. my dad thinks this blog is great and he would like to get in touch with u n he knows a lot of arunachala… he would want ur email to interract. r u on facebook? On facebook. Or he can contact me through this blog. Such contact is most welcome. Discovered this blog recently. I’m thoroughly enjoying your articles. Thank you for sharing your experiences with us. It’s interesting to see things from a westerner’s perspective. Also, thanks for the facebook account, ‘Song of the Ribhu’. why r u so much impressed with arunachala . I feel taht you are not spresding the message of Raman maharshi rather you are promoting tiruvannamalai or rajan? Many voices already praise Bhagavan Sri Ramana Maharshi. There is little I feel I can add to what is already there. Bhagavan was drawn by Arunachala, as are many millions of people each year. IF I ‘promote’ anything, it is Arunachala. I also have found it of benefit to provide information that may be of use to the many people. both Indian and westerners, who visit Tiruvannamalai and Arunachala. If you want to see more on the internet extolling Bhagavan Sri Ramana Maharshi perhaps you should start a blog yourself. Hey Richard, sorry I missed you and Carol when you came to CA. I met you when I came with Jim C last Oct. I will be back in Tiru in Nov. and have some questions. Send me an email and I will reply to that. Hope to see you in November. Glad to see the many additions to the site. This is such a wonderful resource for anyone interested in Arunachala and Sri Ramana. Many Thanks for offering it. Thanks a lot Richard. I will ponder over this. thanks Richard. Any idea why the sudden unrest and disturbed meditation after the visit to the ashram. It seems like my sadhana is taking me backwards instead of forward. How does one explain that? Can’t find the answers on my own unfortunately. Forward and backwards are just ideas. How do you measure these in the vast absolute Being-Consciousness-Bliss? Deeper or less deep are what matters. Deeper is more absorbed in Being. Less deep is more being involved with that imaginations of mind, body and world. I have a strange query. I was in the ashram in April of this year for three days. Although I had a wonderful visit ever since I have come back my mind seems to have become more cluttered with thoughts. My meditation is disturbed and I have started suffering from insomnia (It’s 1.30 am in the US right now). I’m unable to explain this unrest. I’ve suddenly been taken by this urge to abandon all books and experience things within rather than reading the wonderful experiences of Bhagavan’s devotees. All this is suddenly creating anxiety in me and I’m confused and baffled by this turn of events. Any idea what could be the reason? Bhagavan is everything to me and I can’t believe I could feel such unrest after returning from his abode. Bhagavan said that real self-inquiry is more of a feeling than a thought. If your urge is to directly know that within you that does not come and go, then follow the urge. Books are mental. They are beneficial in that they can get the mind prepared for inquiry. Inquiry needs no books. It just needs the genuine investigation of what is your real nature. Ramana talked about ‘the stick used to stir the fire.’ This stick gets consumed in the fire when it is not longer needed. Books are for the mind. Are you a mind? Who knows this mind? Does the mind know itself? In this way you can ‘look’ to where the books are pointing, to ‘the unknown knower of all the known.’ There is a Zen saying to the effect that when the master uses his finger to point to the moon (the absolute Self) do not confuse the finger with the moon. I was important for us to visit all these places. I feel important to share them with others as well. I looked at your site, can’t read Portuguese though. Have you considered translating THE book most used at Ramanasramam during Bhagavan’s day into Portuguese? this is the Tamil Ribhu Gita. Our teacher, Nome, along with Dr. Ramamoorthy, a Tamil and Sanskrit scholar, made a wonderful English translation, ‘Song of Ribhu. This has been reprinted by Ramanasramam, and also been translated into other languages (I think Italian and Korean). Maybe it is time for the Portuguese version? I was in Tiru in April and want to return in December with my husband. We are planning on coming in end of December. Do you think it will be too crowded then? Your comments will be greatly appreciated. Deepam is early this year, in Early Dec, so I think it will be OK.
I’ve been visiting T.V.Malai for last five years. When you said they are just six (observed) saints, what about the rest. How does one distinguishes between saints and orange clad men. Is the answer that one should find his guru. Some feel the men in orange are half way to becoming saints. Perhaps some are. As to how to distinguish a saint, a jnani (one who knows himself), there is no outer ‘test.’ One way is by the sense of peace you feel when you are with them. Your website has become an encyclopedia of the holy mountain, i could like to know more on saints (sadhus) in T.V Malai, and their mysterious powers if any. I strongly believe there must exist a bit of secrets still left from A Search in Secret India. The locals say that there are six saints living around Arunachala at any time. Some are known, many are known only by a few, or not at all. There is one man now, who walks the road around Arunachala. He does not wear sadhu’s orange, rather a blanket, or just a dhoti when it is hot. He will refuse any money. If you give it to him, he will just take it and throw it on the ground. The same with food. He is revered by some, unknown by most. Respectfully Respected Sir, I have read your guide about GIRIPRADHAKSHANA, I am verymuch impressed and I want more information from you. After seeing your photos in net and description about other information, I really felt that I have missed so many thing in my life, about information furnished by yourself. We are frequent visitor of Tiruvannamalai and stranch DEVOTEE OF MAHAN SRI SESHADRI SWAMIGAL a grate SAINT who bring BHAGAVAN SRI RAMANA MAHARISHI to the outer world. We are very lucky. From the age of 20 I am coming to T.V.Malai and now I am running 60 with good health/physique. I am very much eager to round with all INNER PATH. I need you help and guidence. I hope you will help me to fulfull my ambitions. I am very much eager and want to speak to you. I want to here your voice, kindly give me your cell number. I am also very much eager to meet you in person. Very good information. We are frequent visitor of Tiruvanamalai. My dad use to come on monthly basis or weekly basis. We got an oppurtunity to visit your blog thru the book “A Guide to Giripradakshina” We are stranch devotee of Sri Seshadri Swamigal & Sri Ramana Maharishi. During next time visit we would like to meet you. I nsaw your post on March 20th. Maybe the next time you are in Tiru? Hi Richard, my name is Royal. Pista and Willa recently turned me on to you and your blog. I’m so ever grateful. I’ve been a devotee of beloved Ramana since he summoned me in 1996. I spent a couple months in T in 2002. I will return to settle there in April/May 2010. I would like to rent a small, modest house in the countryside around Arunachala. I’m coming from Los Angeles. There’s somewhat of an overwhelming feeling of details that is demanding my attention to make this transition as harmonious as possible. I heard a recent change in visa laws for US citizens? My current tourist visa is good until 2012. I obviously need to be free to stay indefinitely. I need some advice in a few areas. Thank you for your selfless service, may the winds of Grace be always at your back! You can get residency permit, that extends that stay beyond the six months of visa, must be done within two weeks of coming to India. Many details you must attend to. Maybe house rent is rs 10,000. Will need to buy AC (rs 36000) and probably scooter (maybe after a while) – rs 40,000- 50,000. Recommend you make a monthly deal with my rickshaw driver, Rajan, to give you the help you need in first few months. Also to make money transfer very easy, we got account with State Bank of India of California. US money goes there. We have SBI account in tiru, use their bank card to get funds. Send me email to ask about more richard@infinitepie.net. The time you come is the hottest of the year. Thanks a lot for the advice. It is very helpful. I’m visiting Tiruvannamalia on April 16th and plan on staying for 2 days at the ashram. I wanted to ask you how long it takes to do the giripradakshina? For someone who is deeply devoted to Sri Bhagavan how would you make the most of the 2 days? I’m asking for your advise since you have spent many years here. I’m visiting from NJ, USA. Thanks for all the useful information you have posted on your website. I look forward to your feedback. Giripradakshina is 4 or 5 hours. What is best for two days depends on you. Many people find just sitting in the old hall is enough. I would try to be up a Skandashram at 8 AM for the chanting. The swami walks up the hill right after breakfast, so you could too. I would say no NOT do pradakshina in the middle of the day, too hot for most westerners. April will be hot, maybe 106 degrees. Thank You. I really appreciated the information you had shared through this blog; very informative. Though I am from Tamilnadu (settled in Bangalore now) only recently I became aware of Sri Ramana Maharishi and his teachings. Thanks again for sharing these wonderful experiences. Planning to visit TVM and walk the inner path soon. Nice postings. Would like to meet you next time when I am in Arunachala. Before you come, send me an email – richard@infinitepie.net. GREAT website! I’m a native Californian (Ojai) who has lived in France the past 29 years, and plan to come to Tiruvannamalai for 2 weeks this summer, roughly the last week of July/first week of August. I find conflicting stories about summer weather, so my question is, is it any hoter than California in summer??!! Most days it will be high of 100 low of 80. Stays hot after the sun goes down, unlike CA. The first step to self-realisation is the “fear of death”. This fear turns one’s mind inwards. I ve experienced it myself. Your posts on samadhis of Smt Sarasvati and Shri A. Ramana helped me to turn my mind inwards. I only need to catch this feeling strongly to move forward. May Bhagvan Ramana maharshi be with me ever. Im an fan of your blog..
Great blog with wonderful inputs on our dear and beloved Arunachala. May Arunachala keep you near him and motivate you to contribute more of the same. i am delighted to found such a great work from you. do you have intrest to do such articles on other holy places? if you are then can get in touch with me. I am not as experienced as you . i am only in begining stage of knowing about siddhars and their teachings. Wow, awesome! Really liked the blog. Keep up the good work.. 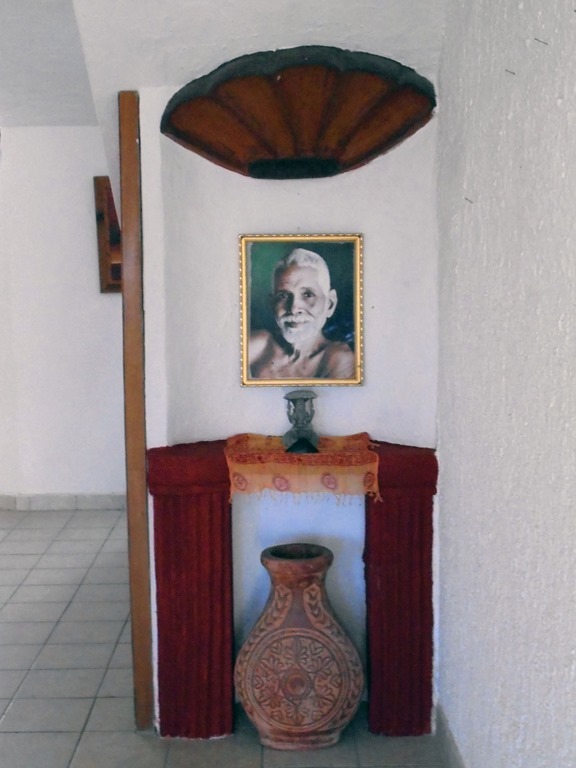 Felt happy browsing through the pics on the blog from the place of Ramana Maharishi. Thanks for putting up such an effort… All the best to your inner quest! very nice ur devotinal site. great work. fentastic superb sir. I love your blog..keep it going! Retired expat life in Mexico and India - Arunachala, Ramana, Tamil culture, travels.